It’s Christmas 2017 and North Korean Dear Leader Kim Jong-un is facing a crisis. Recently the United States, with UN approval, imposed the harshest round of economic sanctions yet on his reclusive regime. While North Korea has been sanctioned since 2006 due to continuing attempts to develop nuclear weapons, this new provocation by its sworn nemesis is the last straw for Kim, who feels the great legacies of his father and grandfather, Kim Jong-il and Kim Il-sung, weighing more heavily each day. This time the U.S., under the leadership of its belligerent president - Trump, the evil, infantile capitalist - has convinced China to agree to a total economic boycott of North Korea. 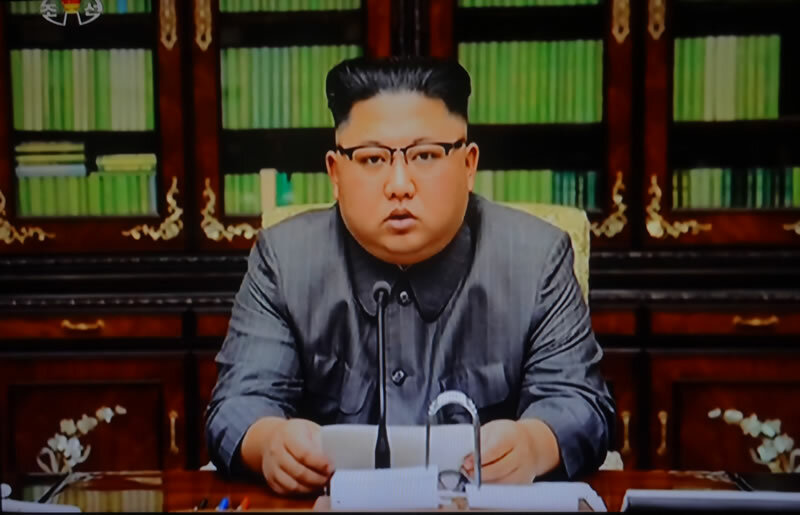 Kim knows that preventing the North from selling its primary export, coal, to China will deprive it of the hard currency needed to import food. A famine worse than the “March of Suffering” in the 1990s, during which millions of people died, is on his doorstep. Backed into a corner with no more “Trump” cards to play, Kim consults his top generals in an underground bunker beneath the presidential palace. The options are considered. An attack on Guam. Nuclear tipped ballistic missiles fired at Los Angeles. Clouds of noxious chemicals piped into the New York subway. An invasion of South Korea. After weighing the gruesome death tolls and potential catastrophic effects on the American economy, Kim decides to detonate a super-EMP weapon, an enhanced hydrogen bomb, at high altitude, smack dab in the middle of the United States, above the state of Kansas. Facts - North Korea already has satellites positioned perfectly for an attack of this nature and two Russian Generals are on record saying Russian super enhanced EMP hydrogen bomb plans were accidently transferred to North Korea. One cold winter morning, at zero dark thirty, a North Korean satellite while sailing over the continental United States drops an enhanced EMP bomb, which detonates 400 kilometers above its target. Immediately, the blast unleashes a flood of gamma rays, causing a massive electromagnetic pulse that fries all electronics on the U.S. Mainland, including the entire system of electricity grids, telecommunications and cellular phones. The first victims are the estimated half a million travelers aloft in planes. Suddenly bereft of navigation systems, most of the aircraft plummet to earth. Traffic and train signals also fail, causing derailments and car crashes. North American stock exchanges don’t open, and banks cease to function since they are unable to loan each other funds. ATMs no longer work, leaving the population locked out of their own bank accounts. Seem far-fetched? Like something out of a Hollywood Armageddon movie? Perhaps. The current U.S. Administration thinks the threat of an EMP bomb so unlikely that it closed the congressional EMP Commission in September. While a large-scale EMP attack has never been tried and remains theoretical, major cyber-attacks have been successfully executed. In our post-9/11 age, where the options of colossal damage to human life are limited only by the imaginations of the misguided, anything now seems possible. So how to protect oneself when so much seems out of our control? Well, the answer lies in what has always been tangible, valuable, and rare: gold. Due to its unique properties, gold was one of the first metals discovered by mankind. Gold is found at surface in flakes and nuggets, making it easily mineable. Historians agree the Egyptians were the first to smelt it and make gold jewellery using the lost-wax method. The funeral mask of King Tut is one of the most stunningly beautiful examples of Egyptian goldsmithing. The Egyptians also learned how to alloy gold with other metals, to vary hardness and color. While gold was rare and valuable, it was also ideal for pressing into coins. Because gold coins were portable, private and permanent, they fit the early definition of a currency. Gold could be used as a medium of exchange, a unit of account, and a store of value. The ancient Chinese, Lydians (in Turkey), Greeks and the Romans all used gold as money, with the Romans acknowledged as the first civilization to employ gold as a currency across their vast empire. Historical records show Emperor Julius Caesar brought back so much gold from a victorious campaign in Gaul to give 200 coins to each of his soldiers and pay all of Rome’s debts. Check out the excellent infographic by Visual Capitalist for more on gold used throughout history. Over time, as countries moved to paper money, they realized they could fix one unit of currency to a weight in gold, a system that became known as the gold standard. Britain was the first to adopt the gold standard and other countries soon followed suit. In the 19th century, all countries except China used it. Domestic currencies were freely convertible into gold at the fixed price and there was no restriction on the import or export of gold. What made the dollar so attractive to use as an international currency, the world’s reserve currency, was each U.S. dollar was based on 1/35th of an ounce of gold (35.20 US dollars an ounce), and the gold was to be held in the U.S. Treasury. Since Johnson refused to raise taxes to pay for A. the social welfare reforms undertaken earlier and B. the war in Vietnam, the U.S. was now running massive balance of payment deficits with the world. Speculation against the U.S. dollar intensified, and when other central banks became reluctant to accept dollars in settlement, the system began to break down. In 1971 US President Nixon ended the convertibility of the dollar into gold for central banks, effectively demolishing the gold standard. The Bretton Woods system collapsed and gold was allowed to trade freely without a U.S. dollar peg. An official "two-tiered" price for gold was announced to the world - the official price of US$35.20 would remain for central banks dealings, the free market could find its own price. Investors love gold because it tends to hold its value through time. They see gold as a way to preserve their wealth, unlike paper or “fiat” currencies which are subject to inflationary pressures and over time, lose their value. In the U.S. there was an increase in inflation for every decade except the Depression when prices shrunk nearly 20%. The Bureau of Labor Statistics’ Consumer Price Index indicates that between 1860 and 2015, the dollar experienced 2.6% inflation every year, meaning that US$1 in 1860 was equivalent to $27.80 in 2015. This also means that prices in 2015 were 2,828% higher than they were in 1860. When the dollar slumped between 1998 and 2008, gold prices nearly tripled, reaching $1,000 an ounce in early 2008 and nearly doubling between 2008 and November 2011, when gold hit $1,903 on the risk of the U.S. defaulting on its debt. Gold has since fallen due to the perception that the U.S. economy is in better shape, judged partly by the current strength in North American stock markets. Gold investors love nothing more than a war, economic crisis or any type of geopolitical instability to watch the value of their bullion grow. Heightened global tensions such as terrorist attacks, border skirmishes or civil wars scare investors into putting their funds into safe havens like gold and stable, high-yield sovereign debt. Geopolitical tensions also drive more government spending (Eg. on arms), which brings inflation, leading investors to look at precious metals as a place to park their money, short term. For example during the 1970s, which saw a number of upheavals in the Middle East including the Iranian Revolution, the Iran-Iraq War, and the Soviet invasion of Afghanistan, gold rose 23% in 1977, 37% in 1978, and 126% in 1979, the year of the Iranian hostage crisis. Gold also spiked when the US bombed Libya in 1986, right after the Gulf War in 1990, and more recently, when ISIS attacks put oil supplies in the Middle East at risk. However it is interesting to note that the price of gold “tends to rise in anticipation of a conflict,” such as the current tensions between the United States and North Korea, “but often falls when tensions turn into a full-blown war,” writes Simona Gambarini, an analyst with Capital Economics. For gold investors, this means timing is crucial in making a gold trade in the lead-up to a war. Staying in too long could mean losing out to other competing assets. Gold is also bought as a hedge against what investors see as government policies that drag down the dollar and create inflation. In other words, gold is an economic safe haven. The most obvious example is the quantitative easing programs imposed by the United States, the European Central Bank and Japan. During QE the central bank “prints money” by adding credit to its member banks’ deposits, which has the effect of increasing the money supply, ergo, creating inflation. Between December 2008 and October 2014, the US Federal Reserve for example added $4 trillion to the money supply by buying Treasuries from its member banks. The other concern that drove investors into the arms of precious metals during this period was the exhorbitant spending by the U.S. government, which hiked the debt to GDP ratio above 77%. An increase in debt not only causes inflation but sinks the dollar, and as explained above, when the dollar falls gold climbs. Gold and stocks also move in opposite directions, since equities often pay dividends and grow in times of stock market expansion, like the current bull market on the Dow and S&P/TSX Composite indices. Gold in contrast does not pay the investor any income while holding it. But gold is usually the best hedge against a stock market crash, such as occurred in 1929, 1987 and 2008. Another reason to own gold are the calamities associated with climate change. While some dispute that the planet is warming or whether temperature changes are human-caused, the increased frequency of major storms in the U.S. and elsewhere is costing nations billions of dollars they had not accounted for. Just look at the recent devastation caused by Hurricane Harvey in Texas and Hurricane Maria in Puerto Rico. Natural disasters not only blow holes in budgets where the money could have been otherwise spent, such as schools and hospitals, they also add to national debts and threaten major social dislocation. Imagine how much damage even a few inches of rising sea levels could do to global coastlines. The prospect of billions of dollars in lost property, and a flood of refugees seeking higher ground is another good reason to own gold as insurance against natural disasters, whether they are caused by climate change or not. In an earlier article I wrote about how extreme solar storms pose a threat to all forms of high-technology. Much is written about gold demand but relatively little about mine supply and how this impacts the price. Of course, if supplies can’t keep up with demand the price will only go higher. While the idea of “peak gold” has its detractors, a Thomson Reuters report said 2016 was the first year since 2008 that gold mine output actually fell - by 22 tonnes or 3%. “There are relatively few new projects and expansions expected to begin producing this year, and those in the near-term pipeline are generally fairly modest in scale, hence our view that global mine supply is set to continue a multi-year downtrend in 2017,” wrote the authors of the GFMS Gold Survey, last January. Thus with gold production falling everywhere except China, whose statistics are often exaggerated by government and can’t be trusted, combined with a lack of large gold deposits that could move the market, you have the setup for a continued rise in the gold price - irrespective of what happens on the demand side. Historically the only way for investors to buy gold was to purchase gold coins or bars, but since 2004 gold, silver, platinum and palladium ETFs have offered a more convenient way to invest in precious metals. According to a 2016 article by Kitco, GLD, the world’s largest gold ETF, and other precious metals ETFs, transparent bullion depositories, and futures exchanges, combine for a total market capitalization of about USD$150 billion - which is almost the value of the entire world’s annual gold mining supply. The convenience of buying “paper gold” through ETFs however has some serious drawbacks especially in the event of a financial meltdown like 2008 or a cataclysmic event like nuclear war, an EMP attack or solar storm. The biggest downside is that unless you have 100,000 GLD shares, you cannot take physical delivery of your gold; rather, the shares will be settled in cash. At the current GLD price, actual delivery of physical gold then is limited to those with a position of about $12 million or more. The other problem is potential breaks in the chain of custody. When you buy shares in a gold ETF, the purchase is through an Authorized Participant, usually a large financial institution. If a primary reason in buying gold is as insurance against a financial calamity Ie. banking system collapse, an ETF really fails to offer any guarantee that your GLD shares would be safe if the bank were to fold. “Physical bullion could go supernova in both price and value, yet ETF proxies could deflate or possibly go bankrupt. All long term investors with exposure to exchange traded funds should reexamine the inherent risks associated with these investment vehicles,” writes Kitco. Many gold investors choose bullion for all the reasons cited above: inflation hedge, long term store of value, and safe haven. But to make any short-term money investing in gold, the junior mining market offers the best leverage to gold due to the potential for profit-taking - albeit, with considerably more risk. Unfortunately 2017 was not the best year to make money in junior gold mining, with the combined strength of other equities, witnessed by record-setting highs on the Dow and S&P 500 exchanges, sucking a lot of wind out of the gold sector. Yet despite parabolic stock market highs, a hike in U.S. interest rates on December 13, and frenzied bitcoin buying, the gold price still managed to gain 10% this year. But as longtime gold market commentator Adam Hamilton pointed out recently, interest in gold meanders constantly between excessive greed and fear. He points out that the last time gold stocks were this out of favor was the second half of 2015, but then, the arc swung violently the other way, with HUI, the dominant gold-stock index (NYSE Arca Gold BUGS Index), rocketing 182% in six and a half months. Hamilton thinks it’s time for another gold stock surge. Despite the assurances of some world leaders, over the last couple of years the planet has become more dangerous, not safer. The threat of nuclear war with North Korea, the repeated cyber-terrorism attacks that will only escalate in frequency and severity continue to occupy headlines. Weather-related events keep wreaking massive damage to crops, property and sometimes, take human life. The prospect of a global financial collapse that could topple major banks as in 2008 never seems to be off the minds of pundits. I own gold bullion, the Boy Scout motto ‘Be Prepared’ still resonates within me. While many investors think stocks are the place to be, with no end in sight to the rally (of the S&P’s 11 main sectors, six are up double digits and only two - energy and telecoms - were down in 2017), the reality is that we are due for a correction. As was pointed out earlier, when this happens, gold tends to rally. I own gold stocks for anything short of outright disaster. I think gold’s price is going to go up, a lot – shares of gold focused exploration and development companies offer the greatest leverage to a rising gold price. The Imaginations of the Misguided, gold and gold equities have been, and will continue to be, on my radar screen. Are they on yours?